“I AM” is an East-West peace building art exhibition featuring 31 premier and emerging Middle Eastern contemporary women artists from 12 countries visually celebrating the rich, diverse and pivotal contributions that Middle Eastern women make to the enduring global quest for peace and harmony. 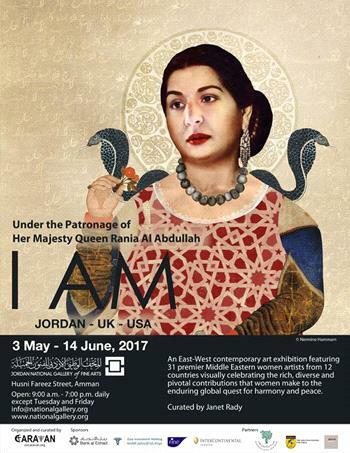 The I AM exhibition will open on 3 May 2017 in Amman, Jordan at the National Gallery of Fine Arts and will run through 14 June. It will then be showcased in 2017 during July and August in London, England on Trafalgar Square (St. Martin in the Fields), followed by in Washington D.C. at the Katzen Arts Center American University in September and October.